NASHVILLE, TN-It's an old question: Which came first, the architect or the acoustical consultant? For the pride of Nashville, its new iconic Schermerhorn Symphony Center, the acousticians from Akustiks of South Norwalk, CT, were tapped for the ambitious project first. They were joined by theater planners Fisher Dachs Associates of New York and David M. Schwarz/Architectural Services of Washington, DC to give the Nashville Symphony a true home. The Center's Laura Turner Concert Hall is a box within a box, both boxes built from concrete and grout-filled concrete block. Some 30 windows consisting of 2-inch think glazing, 2 feet of airspace, and another 3-inch thickness of glass provide natural light when desired, or it may be covered. A motorized convertible seating system can transform rows of raked orchestra level seats into a flat 5,770-square-foot hardwood ballroom for cabaret events by moving seating wagons to storage below. For the post-gala party, the transformation was accomplished in about an hour. For the non-classical musicians who will play the Laura Turner Concert Hall in Nashville, Akustiks employed EAW 761 line arrays, chosen for exceptionally even coverage and hi-fi sound. "This is an important project for me, and it has an amazing amount of technology for a pure concert hall," said Akustiks electro acoustic principal Anthony Nittoli. "Paul [Scarbrough, Akustiks founder/principal] had worked with the Nashville Symphony before, and that we were chosen before an architect was selected shows how serious they were. The Symphony now has every facility in place to do anything; they've already been recording there and plan to record 13 live broadcast programs this season alone." For orchestra pops and other amplified programs, reverberation time can be reduced and clarity enhanced by acoustically absorptive panels and curtains located in the hall. Two sound reinforcement systems have been installed in the hall. A public address system integrated into the architecture preserves aesthetics and is used for pre-concert lectures and general speech reinforcement. The system is comprised of EAW's digital steerable arrays and distributed ceiling speakers by Frazier. For the plethora of non-classical musicians who will play the Hall, Akustiks employed EAW 761 line arrays, chosen for exceptionally even coverage and hi-fi sound, Nittoli said. "The system is rounded out with EAW NT-29 powered speakers for side tier fills and JF-80s for front fill and choral terrace systems. I am very happy with the overall performance of the main system. The tuning process was fairly painless and the systems are performing flawlessly." The hall features a variable acoustic system, deployed automatically in the room and electronically designed to absorb sound and lower reverberation time, he said. "A concert hall sounds wonderful for an orchestra program but doesn't lend itself well to amplified programs. We worked with Joshua Dachs to design a system of soft goods on the side and back walls of the hall, hidden in pockets at various levels that can be raised to significantly lower the reverb time in the room. 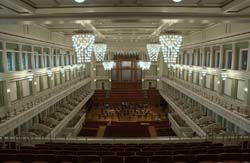 Soft goods in a concert hall would not be good for the orchestral program, so they are stored in acoustic pockets isolating them from the room until needed." "This is a thoroughly modern building wearing somewhat traditional-looking clothing. Beneath its historically-inspired appearance is an incredible contemporary machine with sophisticated technology. We chose equipment in the hall such as robotic lighting fixtures that you normally see in rock and roll, some other lighting equipment is from the movie industry, and there's a wonderful FDA-designed system to convert the room from a sloped to a flat-floor," said FDA principal Josh Dachs. The loft seats, as well as seats along the side of the stage allow the audience to see the interaction between conductor and musicians, and among the musicians themselves, Dachs said. "Attending a live concert isn't just about hearing-it's about feeling close to the music, feeling its physical impact, and seeing the musicians. Watching the conductor interact with the orchestra from the musicians' perspective, or watching the soloist Edgar Meyer the other day practically dancing to the music as he played, flashing a relieved smile to his colleagues on stage after getting through a really difficult passage, these are the things you can only get from being at a live performance. FDA wanted to make a hall that let you in on the communication among the musicians, so in designing the geometry and seating layout we tried to bring everyone as close as possible. The public seating next to and behind the orchestra are extraordinarily exciting places to sit." "A concert hall can be difficult to mix in," Nittoli said. "With the variable acoustics systems deployed, the room becomes much friendlier for amplified sound."